These rich chocolate hazelnut cupcakes are topped with a toasted bourbon meringue frosting. In a small bowl, combine the semi-sweet chocolate and boiling water. Stir until the chocolate has melted. In the bowl of a stand mixer, whip the egg and vegetable oil until light and fluffy. Add the granulated sugar, water/chocolate, hazelnut extract, and milk, and beat until just combined. Fold in the dry ingredients until the batter is lump free. Pour it into your lined cupcake pan(s) and bake at 350F/175C for 18-20 minutes, or until a toothpick inserted in the center comes out clean. In the bowl of a stand mixer, whisk together the sugar and egg whites for the frosting. Place over a pot of boiling water and heat, whisking occasionally, until the mixture is hot and the sugar has dissolved. Remove the bowl from the boiling water, return it to the stand mixer, and whip until stiff peaks form and the frosting has cooled to room temperature. Add the bourbon and whip until just combined. Spoon the frosting into a large piping bag and affix with a tip of your choice (I used an Ateco 829). 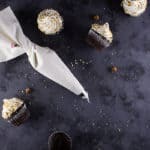 Pipe the frosting onto your cooled cupcakes, dip the sides in your coarsely chopped hazelnuts, and toast the edges with a chef’s torch. Be careful as the hazelnuts are very flammable. Due to the frosting, these cupcakes are best served the same day.